Jake Locker is starting to lose some confidence from me. He sees his team is practically at rock bottom, mostly because of our inept backup QB, and he's not gonna play through the pain? I guess the days of people like McNair and Favre, who'd play through anything to help their team, is gone. And I don't even want to hear "we're 1-4. no reason to risk him". We started 1-4 back in 02 as well, and we weren't even coming off a successful season. In 2001 we went 7-9. Last year we were 9-7. Yeah let's throw him in during a lost cause and really ruin his career though injury. The exact excuse that I expected. What a joke. We're 1-4. Not 1-15. McNair would suit up and try and right the ship. I expect the exact same from Locker. We're 1-4 but that doesn't even begin to tell half the story. We have been absolutely destroyed in four of those games and the other was a complete fluke and a game we still tried our best to lose in. Even with Locker in for the rest of the year I just cannot see this team winning more than four games. They are pathetic. Believe me, I want nothing more than to see Locker play every week because I cannot take seeing Hasselbeck out there anymore. Locker was the biggest thing to look forward to this season for me. To make matters worse the Titans are being televised live over here for the first time this season on Thursday night and I have to sit up until 5am to see Matt Hasselbeck repeatedly throw it a maximum of three yards down field. Of course I want to see Locker in but not if it's going to continually hamper his career in the long run. Dude separated his shoulder...twice...in a month. It's not like we are in a playoff race or anything and one more hit to that shoulder and he's gone for a long long while. Just give him a break, there are way worse things we need to worry about. How about the line that gave up the the clean hit to separate his shoulder? Or the historically bad defense. It's not worth it to ruin Locker's career/season over getting killed by the steelers. You think James Harrison is gonna hold up from going for that shoulder if he plays? Thank you. At least we see it through the same light. It just isn't worth risking him long term for a season that is a lost cause. You might not thing it TL and i wish you were right but the players and coaches aren't doing much to disprove me theory. But it was the 2nd ranked team. LSU won so aka they would be 1st right? either way Im having no luck! I looked and they were number 2 coming in so maybe your right! The whole "Locker needs to suit up" argument is stupid. Do you really want to risk his season/career for one game? He dislocated it TWICE in a month. That's not a good thing. If it was a rib issue you put extra padding in there. If it's an ankle you play through. The shoulder is complicated. If he pops it out for the 3rd time in a month it'll get worse and he'll likely have to get surgery and the whole year will be lost. One site suggested it was Damian Williams, if you wanna check that, lol. maybe they were at one point as high as #2? 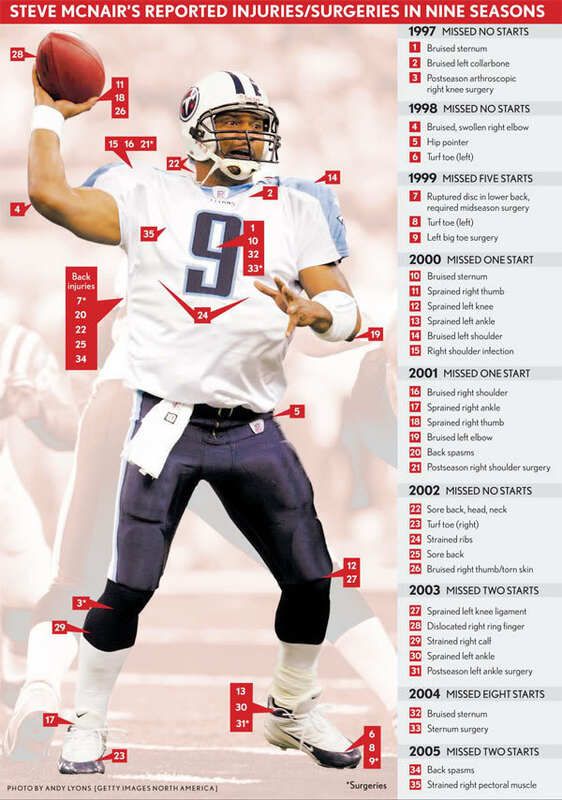 I hate that posters (maybe not many but a few) are trying to blame Locker for not playing through this and bringing up the inevitable comparison to Steve McNair. People may not want to talk about it, but maybe Jeff should have stepped up and made Steve sit out a few more times. I loved Steve, hell I still do, but the guy was plagued by injury after injury throughout his career, and I have to believe some of that came from the fact that he was trying to compensate for his current injury which led to even more of them. The guy was a warrior. A leader. He loved the team and the fans loved him. But do I want Jake to have to deal with the amount of injuries that he did every single year or would I rest him when he separates his shoulder for the second time in a month regardless of whether or not he was begging to suit up? Rest him every time. If we believe he is the future of this franchise, we want to make sure he is healthy. The last thing you want to see is him trying to protect his shoulder and injuring his throwing arm or an ankle or a knee or one of the dozen of other ailments that Steve suffered through. McNair never truly developed into the consistently elite quarterback that many of us thought he would be, and I would argue that much of that comes from the warrior mentality that prevented him from almost never being at 100%. McNair was simply an injury prone player. If he didn't play through his injuries, he wouldn't have had a career. It had nothing to do with "he should have sat more". He was just extremely brittle. He quite literally had injuries from head to toe. This isn't just some period where we're .500 or just a game out of first place in our division. Our season is headed straight down the [inappropriate/removed], and the biggest reason for that, the past two weeks anyway, is the play of our backup QB. As much as I love Hass and what he did last year for us and what he's done to help mentor Jake, he's complete trash now. It's a losers mentality to think "well we'll just wait til next year", and people going around "Oh, I want the entire coaching staff fired", use this mentality? What a joke. Didn't someone post how Munchak said the Titans blitz, but the Vikings scored a touchdown when they did? Christian Ponder had a QB Rating of 102.2 when there was no pressure, but was down to 38.5 when there was pressure. It was a good thing for the Vikings he was only pressured on seven of his 39 dropbacks. This whole coaching staff needs to just get out. I'd be interested in seeing this breakdown for all the QBs we've faced so far. Last year too, for that matter. Anybody know where these stats can be found?